The United Nations General Assembly overwhelmingly voted on Thursday to condemn President Trump’s decision to recognize Jerusalem as Israel’s capital. Yesterday, both President Trump and Nikki Haley threatened to cut off funds to those in the UN who voted to condemn the United States. I hope they keep their word and cut every one of these bigots off. Immediately. Haley warned today that those financial consequences are coming. We are not shifting our position on supporting Israel recognizing Jerusalem as their capital. The UN has no right to condemn the right of the US to choose where their embassy is located. We are a sovereign nation. We will not forget those who voted against us when they come begging with their hands out for money. The vote that took place at the UN today will be remembered and acted upon. Haley is right… the UN resolution ‘disrespected’ the US after we have contributed so much to that worthless global body. To dictators, communists and Islamists… we are done groveling before you. “When a nation is singled out for attack in this organization, that nation is disrespected. What’s more, that nation is asked to pay for the privilege of being disrespected,” Haley said. “[T]his vote will be remembered,” she said after arguing that the US has an obligation to “demand” more from the investments it made to advance its own values and interests through the UN. And by every measure, the UN is a lousy investment for us. “We will remember [this day] when we are called on once again to make the world’s largest contribution to the United Nations. And we will remember it when so many countries come calling on us as they so often do to pay even more and to use our influence for their benefit,” Haley said. We contribute 22 percent of what the UN sees each year… far and away more than any other country. “For all these nations, they take our money and then vote against us. They take hundreds of millions of dollars, even billions of dollars and then they vote against us,” Trump told reporters at his Cabinet meeting. “We’re watching those votes. Let them vote against us. We’ll save a lot. We don’t care,” Trump said yesterday. I love that. It made me happy all day yesterday. This resolution is an attack on our sovereignty as well. We are not part and parcel of a global cabal. And we don’t answer to globalists. 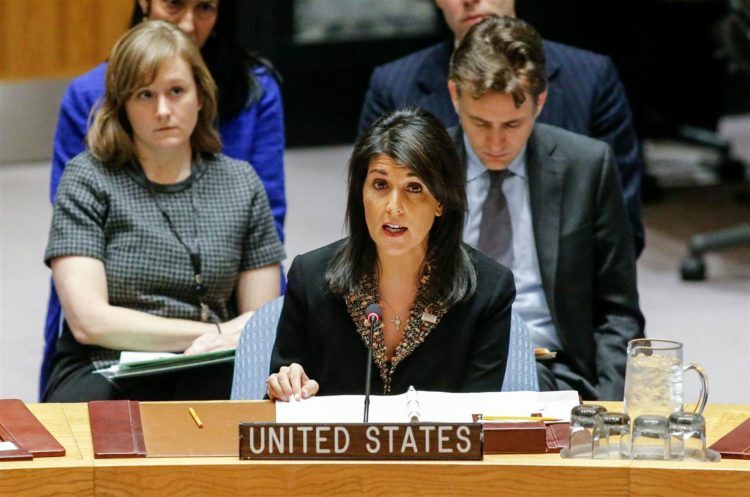 “The United States will remember this day in which it was singled out for attack in the general assembly for the very act of exercising our right as a sovereign nation,” Haley said. One Muslim group at the UN today called Trump’s tactics bullying. It’s bullying to stand up for yourself? It’s bullying to say where your money goes? It’s bullying when you defend an ally that is being unjustly attacked simply because they are a certain religion? You can get stuffed. Haley warned that we were taking names. She meant it and so did Trump. Nihad Awad, national executive director of the Council on American-Islamic Relations, tweeted: “Our government should not use its leadership at the UN to bully/blackmail other nations that stand for religious liberty and justice in Jerusalem. Justice is a core value of Christianity, Judaism and Islam.” CAIR can go know themselves in the biblical sense. He’s a lying hypocrite. Turkey’s President Tayyip Erdogan responded Thursday by accusing the US of buying support in exchange for foreign aid. “Mr. Trump, you cannot buy Turkey’s democratic will with your dollars,” Erdogan said in a speech in Ankara. “I hope and expect the United States won’t get the result it expects from [the U.N.] and the world will give a very good lesson to the United States.” Turkey can get in line with CAIR. The resolution, which was overwhelmingly approved on Thursday by a 128-9 vote, with 35 abstentions, is co-sponsored by Turkey, chair of the summit of the Organization of Islamic Cooperation, and Yemen, chair of the Arab Group at the UN. It’s good that it is being made abundantly clear who our enemies are.